Plan Your Destination Wedding in Roatan! You know you love your job when you can’t wait to get home from vacation to blog about work. In this case – how to parlay work into vacation by planning a destination wedding in the fabulous place you just stayed! So here I am, in my own private villa, the Carribean Sea lapping at the sand outside my window – dreaming of the perfection of exchanging vows at sunset at Barefoot Cay Resort in Roatan. This Conde Nast gold rated gem is absolutely PERFECT for so many reasons! The size of the resort – a max of 25-30 guests means you can book the entire place and have a private paradise for you and your guests. The staff outnumber the guests, and are the most friendly and talented group I have met while vacationing. Everyone knows our names – and we know theirs. The accomodations range in price – with even the most luxurious being more maneagable than most places in the Carribean. You can go either a la carte or all inclusive on meals – and all the rooms have full kitchens! Of course, the food is magnificent so I haven’t had much to eat in my bungalow! For the ceremony itself I can’t decide where the most picturesque place to exchange vows might be – the Palapa reaching out into the ocean, or the beautifully combed sand at the edge of the sea – so many choices! The reception will be perfect – the food presentation and taste divine. Wouldn’t it be wonderful to know that the requests we are making on the mainland actually reach the willing ears of the chef and an expert staff? Paired with LOLA coordination and ideas, this place is a winner! Who wants to plan with us? 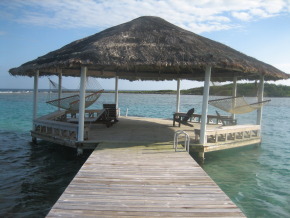 And now, I go back to my vacation – what to do next… nap on the private beach? World Class Scuba? Some zip-lining or a trip to town? Hmmmm… I like my choices!